The Moulin Saulnier, originally a watermill, now part of the Menier chocolate factory in Noisiel, France. Built in 1872, it was the first building in the world with a visible metallic structure. 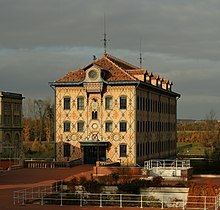 Wikimedia Commons has media related to Industrial architecture. Jefferies, Matthew. Politics and Culture in Wilhelmine Germany: The Case of Industrial Architecture. Washington, D.C.: Berg, 1995. Jevremović, Ljiljana; Turnšek, Branko A. J.; Vasić, Milanka; and Jordanović, Marina. "Passive Design Applications: Industrial Architecture Perspective", Facta Universitatis Series: Architecture and Civil Engineering, Vol. 12, No. 2 (2014): 173–82. Jones, Edgar. Industrial Architecture in Britain, 1750–1939. New York: Facts on File, 1985. McGowan, F.; Radosevic, S.; and Tunzelmann, N. von. Emerging Industrial Architecture in Europe. Hoboken: Taylor and Francis, 2004. Winter, John. Industrial Architecture: A Survey of Factory Building. London: Studio Vista, 1970. This page was last edited on 14 May 2018, at 07:43 (UTC).